It's a dark, rainy night in a metropolitan park. The crosshairs sweep onto a target then lock on. Through the rifle's lens, an infrared green glow illuminates the unsuspecting enemy, making him shine in the murky darkness. Washington D.C. is threatened by the deployment of a biological weapon capable of killing millions. Gabe Logan's orders are to end the terrorist standoff through the only means available - direct assault tactics. The action ensues with heated non-stop gun fire, international intrigue and a devastating conspiracy. Plunge into the frantic thriller where enemies are taken head on or disposed of by stealth maneuver - the decision must be made on the fly. Are you up to it? 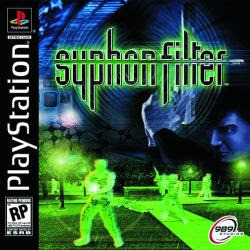 Covert Operative Gabriel Logan and his Expert Commmunications Partner Lian Xing are investigating the location of a laboratory of what they and their Agency suspected was involved in creating a powerful next-generation biological virus, called Syphon Filter. During the operation, another lone American special agent Ellis is executed nearby after being held captive, captured carrying out the same operation. Nearby his dead body, the laboratory they were searching for suddenly erupts in flames. They could not recover evidence among the scorched remains, and they still know little of the virus. Days later, Gabe and Lian are sent to find evidence from a reported contaminated Nepal village. Gabe and Lian continue on the trail to and determine the next move of Erich Rhoemer, an international wanted terrorist. Soon enough Rhoemer and his men commenced a terrorist operation in the heart of Washington D.C, and makes demands to the government with the several viral bombs planted all over Washington D.C. as his trump card. In response, the Agency assigns Gabe and Lian to counter this terrorist effort, to find and deactivate the viral bombs and free the hostages in attempt to foil Rhoemer's act of terrorism. Gabe gets assistance from the US Army Chemical and Biological Defence Command (CBDC) and Lian who will stay in frequent contact with Gabe throughout his missions. One of the best orginal TPS.